Just like that I'm back to acrylics. 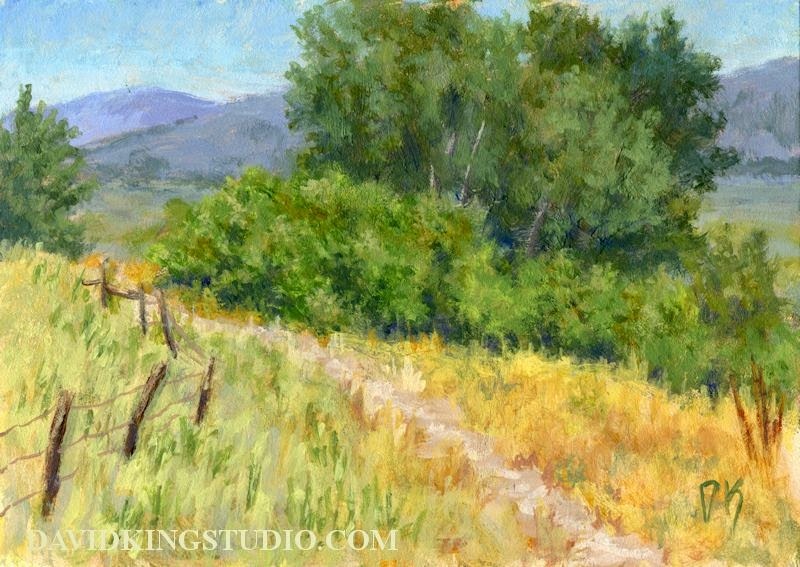 This is one of many great views available in Ogden Valley, Utah, a mountain valley about 40 miles north and east of the Salt Lake Valley and home to the beautiful rural towns of Huntsville, Eden and Liberty and Pineview Reservoir. This valley is just chuck full of artistic inspiration. I've visited the area many times and every time I go back I discover something new. Here I am playing with the oils again. Actually I painted this three or four weeks ago but didn't decide to share it on the blog until now. I've already got another itch to play with oils again so you may see more soon. Oil on panel, 8" X 10"
This unusual tree resides in a nearby park and I just had to paint it though it took me a while to get to it. I took the reference photo a year ago! 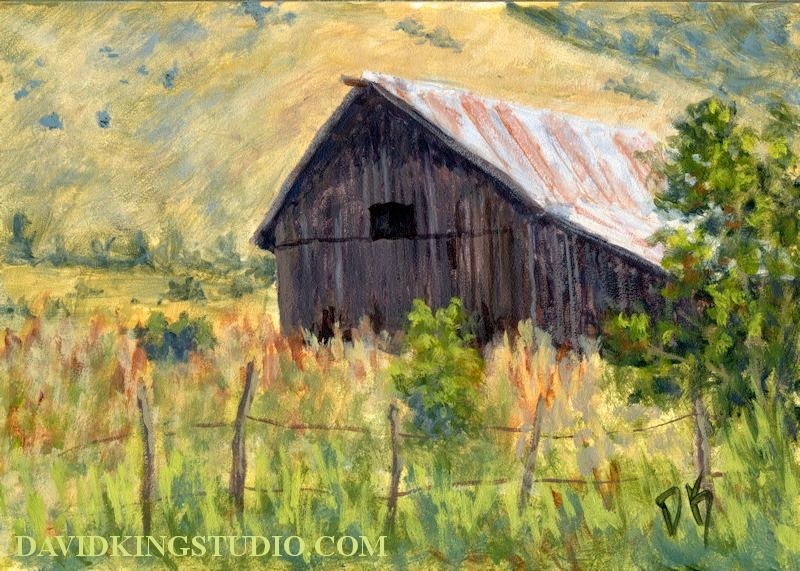 I chose to portray it in early spring so I could paint that interesting structure yet have some of the leaves coming in to add some color. That's the famous Wasatch Mountains in the background. acrylic on 1/8" panel, 5" X 7"
. 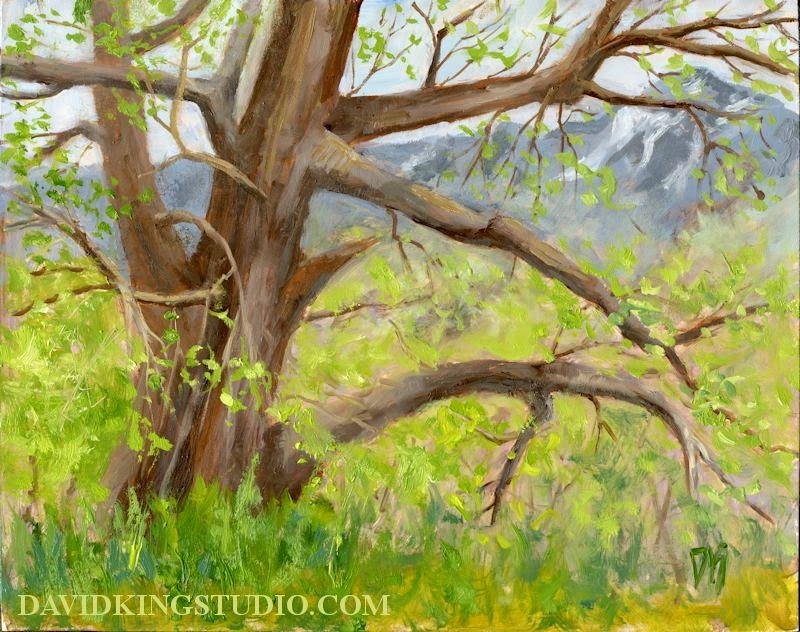 This painting is based on a photo I took somewhere in Ogden Valley, probably in or near the town of Eden. I knew it was coming some day, they hung the "For Sale" sign on the fence about a year ago and obviously they finally found a buyer. I came home from work yesterday to the sight of excavating equipment parked in the field next to my home. I knew shortly some of my favorite things to look at out the North window would be gone. Sure enough as I was leaving for work today the equipment was being fired up........I came home to a scene full of piles of rubble. Nothing good lasts for ever unfortunately, I just hope they aren't going to build townhomes here. This post makes four days in a row, I think that is a record for me. I really am trying to paint and post more often, hopefully I can keep it up. This is the second day in a row for a new painting even, I think that's a record too! Acrylic on 1/8" thick panel, 5" X 7"
This painting was experimental in two ways. First I tried to keep it looser than I've painted vehicles in the past, I think I pretty much succeeded. It was also much more enjoyable to paint this way rather than cause neck strain trying to capture every single little detail. Also, I tried the "selective start" method again like I did with the "Keep Out" painting but with a modification. I still did not lay the painting out with pencil or paint first, but rather than paint each shape to completion before moving to the next shape I only blocked it in, then I'd block in the shape next to that one and so on until the whole painting was blocked in accurately. Sorry, I didn't take any progress photos on this one, but in this case I started with the wheel, just painted the whole thing in one solid rusty color. Then I painted the tire, then the fender, then the hood side, hood top and so on. This allowed me to make some adjustments along they way before I spent too much time on the details. Since the block in was accurate and complete I then only needed to fill in all the smaller shapes and details inside the larger blocked in shapes. 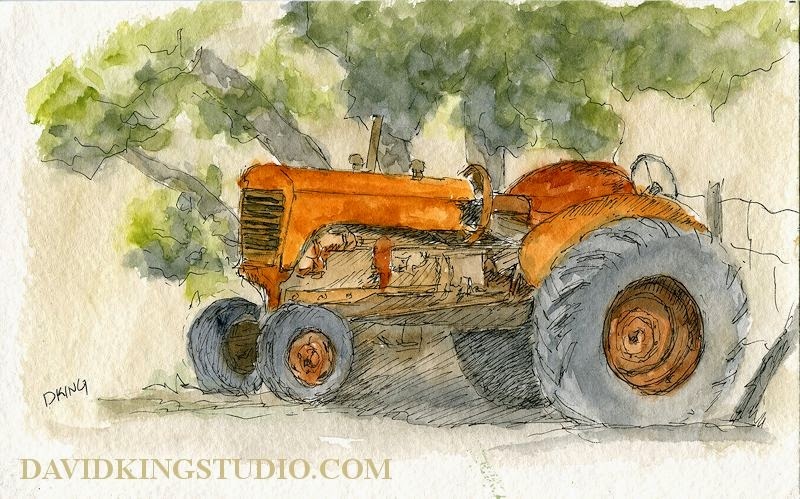 Pen & watercolor on paper, 5" X 8"
This is actually the same tractor in the pencil sketch from the previous post at Wheeler Farm, just a different angle and different time of year. 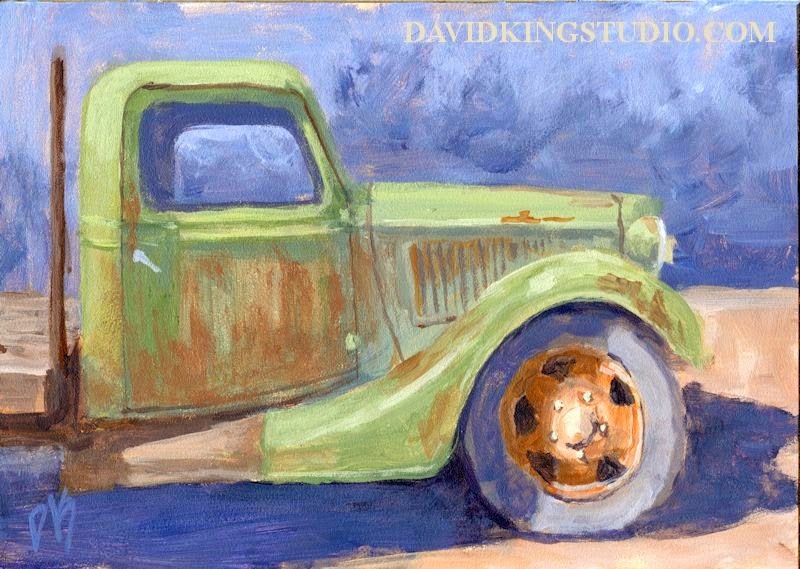 What is it about old tractors that make them such appealing art subjects? Is it the nostalgia for the "simple life"﻿ of the independent American farmer? Or is it the interesting shapes and colorful patina? Or is it both? Here's a little blast from the past. 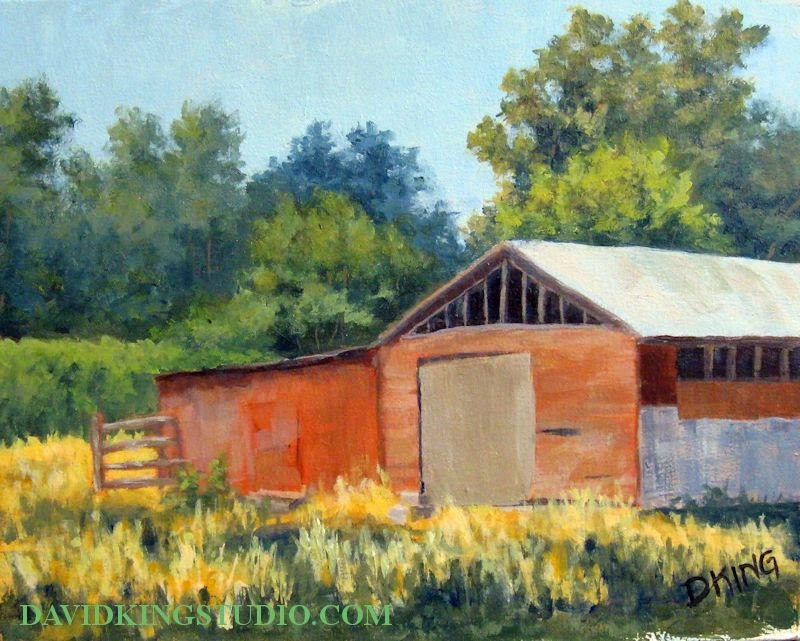 I'd made this sketch a year or so ago at Wheeler Farm. I'd posted it to my old sketching blog but have never shared it in this blog, it's one of my favorites so I figured I post it here too. 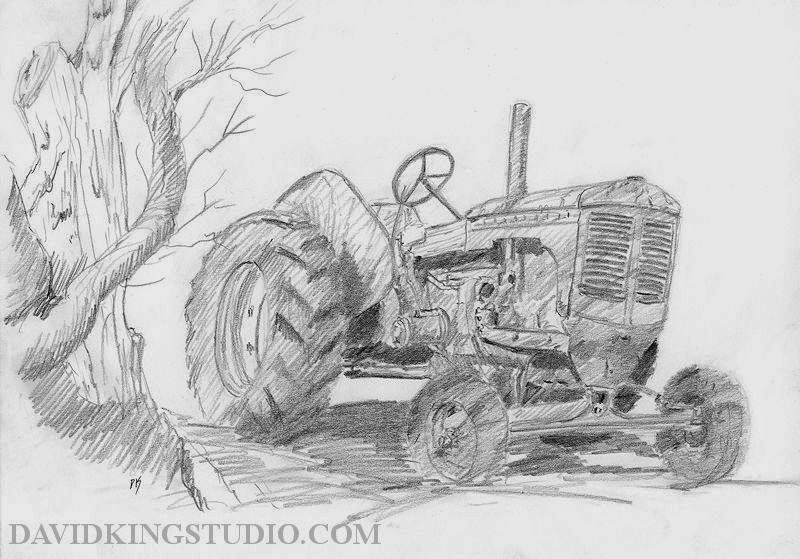 Graphite on paper, 7.75" X 11"
Visit David King Studio Prints! Mother Nature hasn't been too kind to me lately. Seems like whenever I have the time and want to go out to paint or sketch she decides we need water. Today was looking like one of those days as well, however in the afternoon the showers were intermittent and we even had periods of spotty blue sky revealing the sun. I decided to take my chances and grabbed my sketching gear. 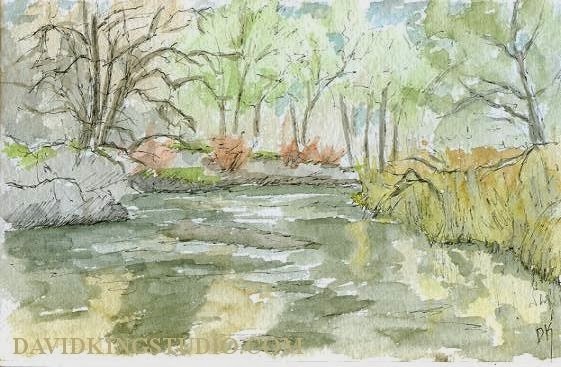 Besides getting some sketching in, one reason I wanted to get out was to scout out some possible painting locations that I could get to quickly after work, so I explored a small section of the Jordan River Parkway that I hadn't visited in a long time. 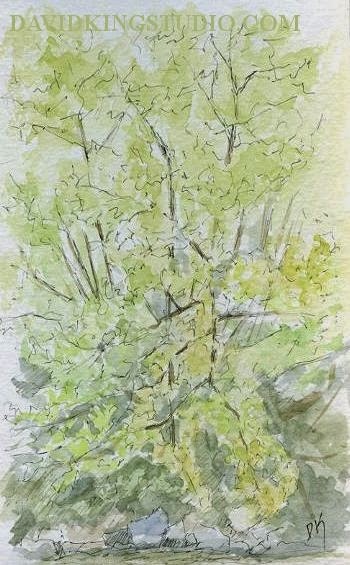 While exploring a little used "unofficial" path I didn't find any good spots for painting but I decided to sketch this tree on the opposite bank of the river anyway. The leaves are just starting to come in which allows me to add some color but much of the structure of the tree is still visible. That's what these sketches are mainly, just studies. I'm no watercolorist so I don't expect to create real paintings. For me, watercolor is just a convenient medium for adding color notes to my sketches making them studies that will hopefully help me when developing paintings in the studio. Shortly after I started this sketch it started to rain. It wasn't really a rain, more like a heavy shower. I could tell it wasn't going last long so I decided to wait it out. I did have to turn my sketchbook over though while I mentally kicked myself for not getting the umbrella out of the trunk of the car. To make things even more fun the rain turned into hail but at least the pellets were small and it lasted less than a minute. And then the clouds parted and the sun appeared and wouldn't you know it, but it was directly in my eyes for the duration of the sketch. Only in spring can you go from overcast, to rain, to hail and then to full sun in the space if ten minutes. 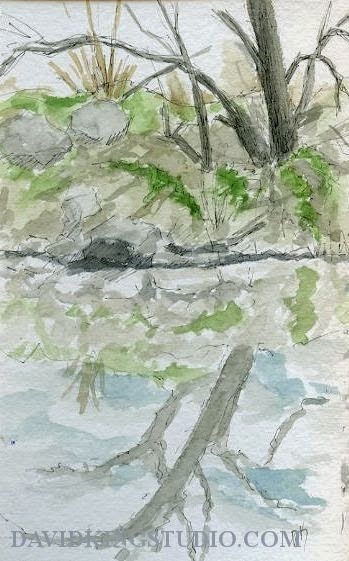 I then wandered over to the other side of the river and found this interesting scene with a tree giving a strong reflection in the water and decided I had to sketch it. I'll admit, I kinda rushed this one. I found a stump to sit on but it wasn't as comfortable as I thought it would be. After finishing the sketch I then started to continue up the path and realized the sky to the North was very dark, so I turned around and went back to the car thinking my sketching session was done for the day. However when I got to the car I realized all those dark clouds were moving to the East so I decided to chance it and headed back to the path, this time I got the umbrella out of the trunk and took it with me. The umbrella did come in handy, it was a light shower that only lasted a few minutes just before I started this sketch but still, it was nice to not get any more wet than I already was. I discovered a sand bar that was accessible that gave me a real good view down the river. I suspect this sand bar is under water much of the year so I took advantage, I might return with the painting gear soon before it gets flooded again. So, it was a little wet and a little cold at times today but it was worth it to finally get out of the house and do some sketching!